Cell phones are so much more than cordless telephones; not only do some devices provide you with a considerable amount of memory capacity, but it is also becoming more and more common that an exchange of data (music, videos, pictures) between a computer and a cell phone can take place. This leads to an important question: how can one get the best out of the memory space a smartphone can provide? A popular first choice for accessing a phone’s SD card is USB connection—but it that really the best option out there? DavDrive provides you access to the SD card via WLAN. You’ll find out more in today’s review. This review is a result of a collaboration with the AndroidPIT community member Darth Weicon. Thanks! DavDrive performs in the same way as a server would in the internet. You can access your phone via a browser or one of your file managers. This allows you to work on your files exactly as you would from you computer. The downside (for which we’re knocking a star off the rating) is that it isn’t possible to access your computer from your phone. That’s a bit of a downer, but we’ll manage without, even without this feature. DavDrive is extremely easy to use. In order to activate the app simple press on the on/off button. An IP address will then appear; the address has to be pasted to the browser. Please note that you need a login and password for the browser—the font of the pop up that tells you what to do is rather small and can easily be overlooked. •	Start: You can select if you want DavDrive to start up atumotically. 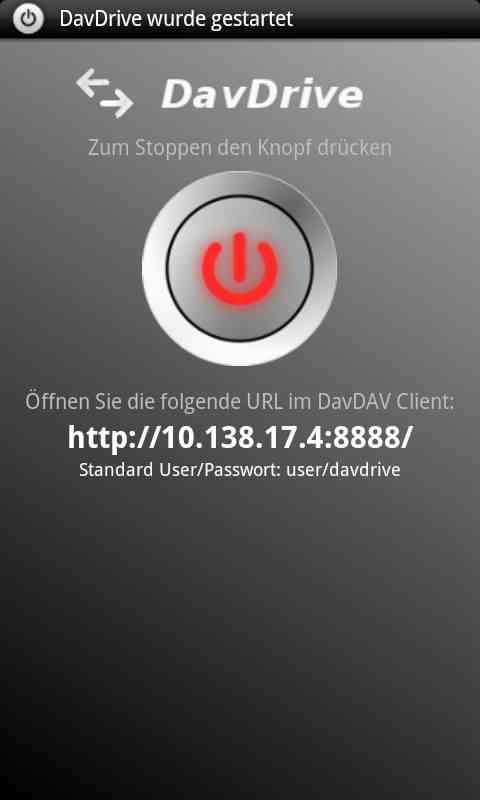 DavDrive provides your Android phone with fast, stabile connection. The app supports Mac OS X, Ubuntu, and Windows, which should make it easy for everyone – even those of you who don’t have a lot of experience dealing with smartphones – to connect your computers to your cell phones. Anyone who’s like me and needs/wants to move large amounts of files to your phone will find DavDrive to be an absolute must have. DavDrive reacts very quickly. Copying and pasting large amounts of data works really well. DavDrive can be downloaded from the Market/AppCenter for 0.99€. Considering what this little app is capable of the price is totally justified. it's corrupting all downloaded files bigger than 1mb. Please fix it. bigger - get the false data. So there is some problem with it. Ik work succesfully with DavDrive Lite, but on my Galaxy S4 Zoom I cannot reach my SD-chart that way. What to do? I use this app and I like it. I'm the developer of DavDrive. I contacted Robert. Hope we can sort this out. In case of questions just send me a message. A HTTP server is also part of File Expert, which is a full sized file manager.